According to official Notification UPSC / C-529 / 234 2014-15 dated 11 November 2014 , UPHESC will conduct a state level written examination 7 December 2014 Sunday. 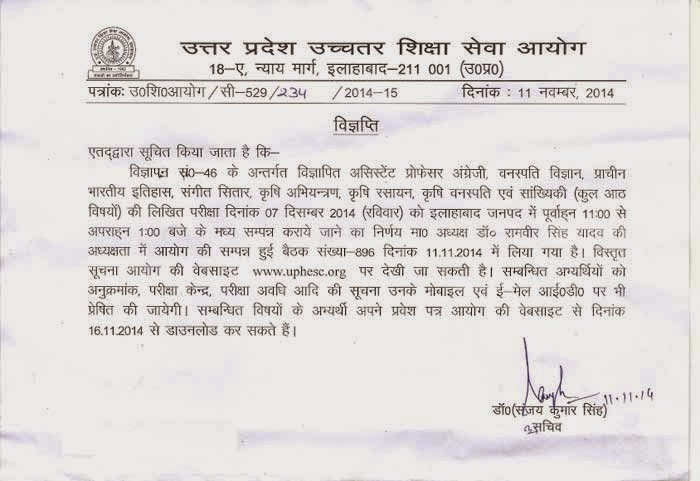 Written examination will be held at Allahabad examination center from 11 am to 1 noon. This decision was taken by chairman of UPHESC. UPHESC will host admit card online for all candidates. Candidates can download there hall ticket / call letter via entering there registration no/. Currently admit card are available for 8 subject which are mentioned above. Very soon we will give you latest news update of admit card for other subject and detailed time table. Admit card will be available for download from 16 November 2014.